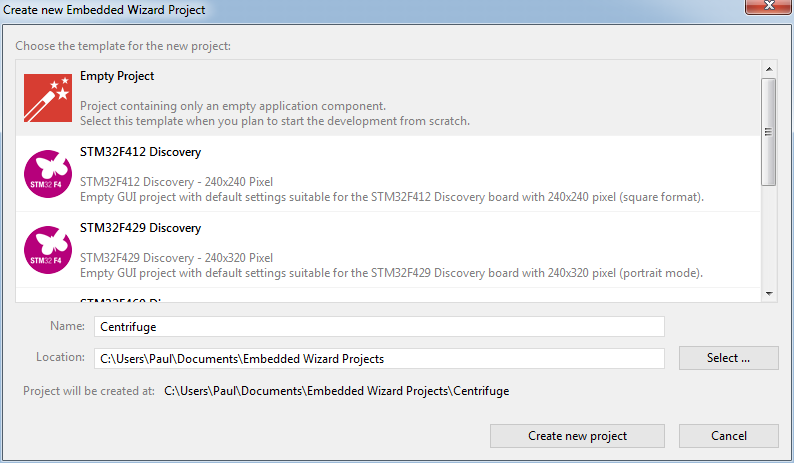 The main area of the dialog displays a list of available project templates. For every template a short description is provided. You can scroll the list and select the best suitable template for the application case you intend to implement. ★Click on the first edit field and enter the project name. ★or click on the button Select ... to open a directory selection dialog. The location has to be an absolute path starting with the drive letter (e.g. C:\). Selecting a network path will not work. In such case you have to configure the MS-Windows to assign to the network path a drive letter and use this letter in the location. Once the project name and location are specified click on the button Create new project.